Crown hydration damage is "one of the most destructive yet least preventable forms of winter kill" according to many turf researchers (Source). The causes are well known, but the reasons why some years are worse than others are not fully understood. In January, I wrote a bit about this frustrating phenomenon in another post, "Good Winter or Bad Winter for Turf?" I still can't quite explain why last winter was so much worse than the winter of 2008-2009, but I can explain the cause of the damage -- too much water and ice! The yellow lines show the water flow patterns on this fairway. 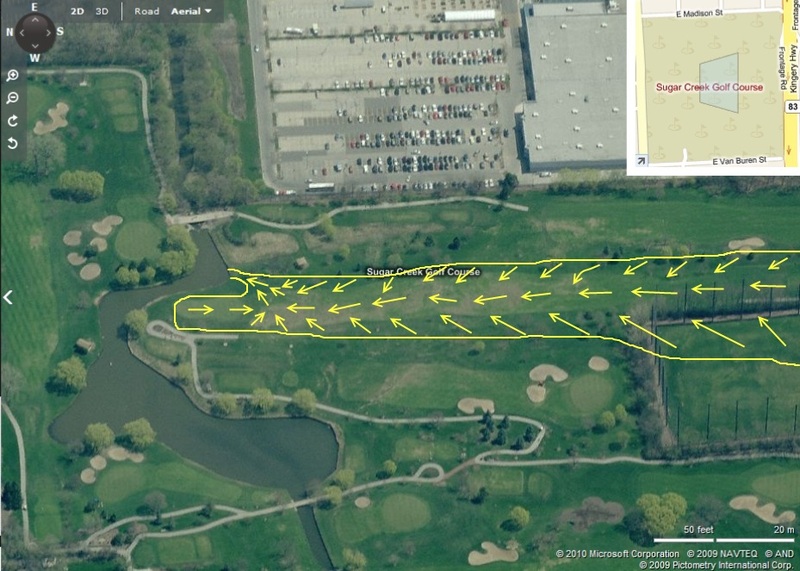 Essentially, about 5 acres of land needs to drain through a narrow corridor by the 7th green. Most of the land is not sufficiently pitched to make this happen quickly. While the ice is melting, water fills the area in front of the green and re-freezes causing crown hydration winter kill. The areas with ice in this picture were covered for around 3 months this year, but it was the freezing and thawing that really hurt them. Since this is a recurring problem, we took steps last week to improve these areas, hopefully long-term. Aerified again week of March 22nd. Cut slits into the soil on March 31. Spread bentgrass seed with drop spreader. Topdressed with sand to cover seed and fill slits. Groomed area with drag mats. Now that soil tempuratures are rising, we have a good chance of regrowing these areas with a hardier species of bentgrass that should be more resistant to winterkill than the annual bluegrass that was in these areas previously. It is unfortunate that these areas died, but there is a silver lining. Sometimes, when nature throws us a curveball, it allows us to improve an area in a way that would not be possible otherwise. These areas should begin germinating in 1-2 weeks. Soil tempurature is the determining factor. Warmer tempuratures will speed up the process. In the next 2 weeks, we will see how these areas react to our cultivation and seeding. If there are areas that do not germinate well, they will be sodded. One of the best things about this process is that the area does not need to be taken out of play. The turf is playable and golfers will experience good lies even in areas that appear brown. The area is visually improving every day. 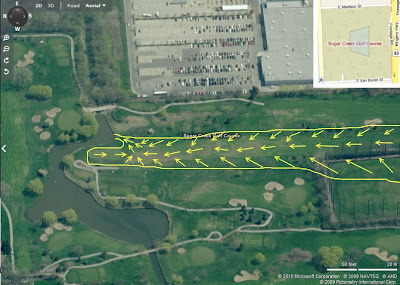 Kevin - Neat blog, I have always noticed that soggy feeling on the 7th fairway after a good rain when playing Sugar Creek. Hopefully this remedy will help. Love your course, keep up the great work!